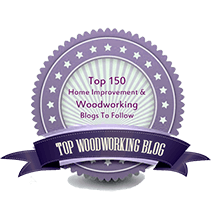 Again emerging from the sawdust and shavings of my shop, here are eight more quick tips that I hope you will find helpful. Pictured above, the Big Gator drill guide is great for accurate perpendicular drilling when use of a drill press is impractical, which is surprisingly often. There are cheap tools for the same purpose but this one is nicely machined to tight tolerances and feels solid. 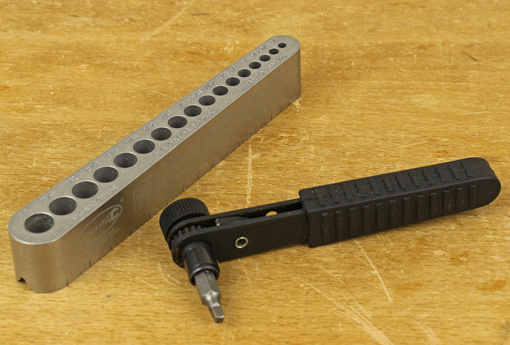 This model has holes for 1/8″ – 3/8″ in 1/64″ increments and others are available. Big Gator – they must be in Florida right? Nope, Kansas. Next to it is a mini ratchet driver that takes 1/4″ hex bits. Whew, this tool has saved the day in tight quarters numerous times. I’ve used it not only with short driver bits but also with short hex shank drill bits. You can probably find one at a local hardware store that’s inexpensive enough to buy before the day you need it. 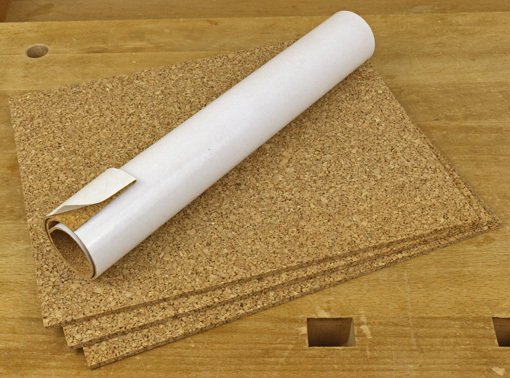 Below, cork sheet is probably the handiest shop material that comes from trees that isn’t wood or paper. Having just the right balance of firmness and resilience, without a slick surface, it is useful for clamp pads, sanding blocks, pads for metal bench dogs, and so forth. Find it in craft/hobby stores in various thicknesses, with or without PSA backing. When I bought the transfer punch set four years ago, below left, it vaguely seemed useful but I had nothing specific in mind. Time and again since then, however, I’ve realized, “Oh, I have those, this will be easy.” The set includes 3/32″ – 17/32″ in 1/64″ increments. You could use brad point drill bits for the same purpose but these are more suited to the task and most of us don’t have all those sizes in brad point bits. My set runs about .001″ – .0015″ undersized, which works out fine. Lee Valley sold me again with the feeler gauge set with unusually long 5 1/2″ fingers. I have a standard length set but this is the one I reach for when tuning machines. The extra length usually proves helpful and, unlike most sets, it goes down to .001″. 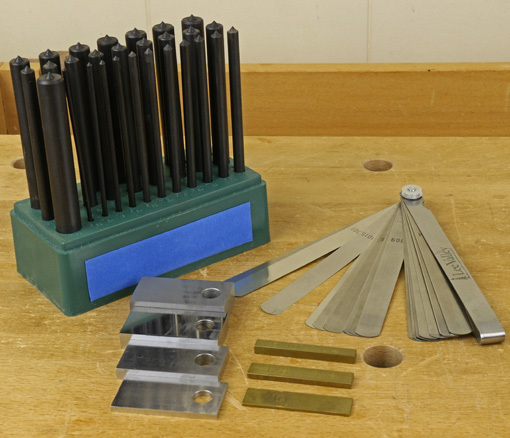 Gauge blocks are usually more accurate to use than a rule when making settings at the router table, table saw, and bandsaw. There are more complete and clever sets available but I usually get what I need by combining 1/16″, 1/8″, 3/16″, 1/4″, 3/8″, 1/2″, 1″, and 2″. I suppose I could use a metal 1/32″ instead of the caliper-validated piece of wood I use now. I’m not sure if I’m on board with all of these silicone gluing accessories but I do like the little textured roller and tray. It is just under 2″ wide but really speeds application on moderate-size open areas. Wait until the glue is dried before cleaning and then it’s amazing how it peels off. 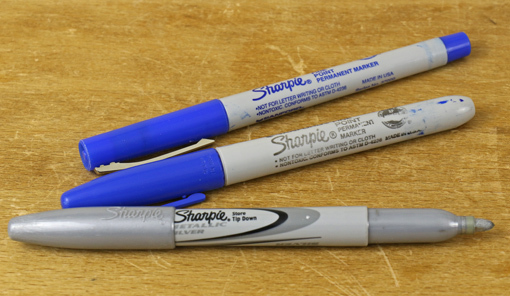 Accept no look-alikes; Sharpies are awesome! 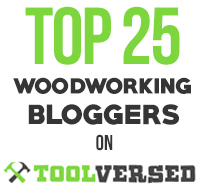 They write on just about anything – router bits, jig hardware, storage units, and on and on. I write lots of notes on jigs, templates, and tools to save head scratching later on. Oh, and be sure to keep at least one handy in the shop in case anyone stops by with an autograph request. The Metallic Silver Sharpie is a great all-around lumber marker that shows well on planed and rough wood of any species. It doesn’t tend to bleed in like the regular colors. I wish they also made it in the Super size point. I just ordered the gator drill guide. I usually make something like this out of wood and that doesn’t always work. I also like this this will work on circular stock besides flat. Great tips. And I’m going to get a silver Sharpie! No more searching for pencil marks on walnut! Nice tips. I’m definitely getting those silicone gluing accessories for sure. 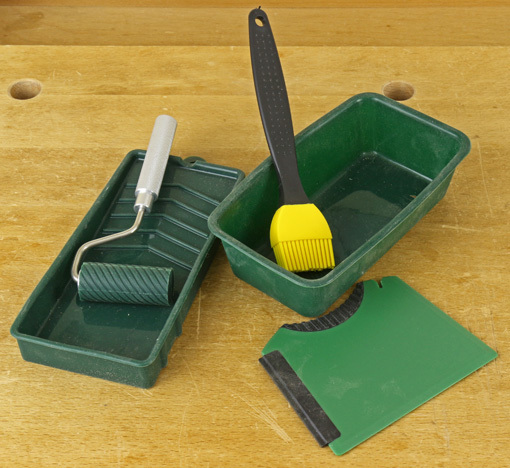 I like the roller and tray, as I mentioned, but the brush gets just a fair rating. In any case, it works better if the bristles are cut shorter.